He refused to associate himself with any investigation which did not tend towards the unusual, and even the fantastic. David Milner, a neuropsychologist at the University of St. Andrews in Fife, Scotland, was so eager to get to the hospital to test his newly arrived patient that he almost forgot to take along the case notes describing her condition. He had to rush back to his house through a cold winter rain to fetch the folder describing Diane Fletcher. The facts were simple but tragic: Diane had recently moved to northern Italy to work as a freelance commercial translator. She and her husband had found one of those lovely old apartments near the medieval town center, with fresh paint, new kitchen appliances and a refurbished bathroom — a place nearly as luxurious as their permanent home back in Canada. But their adventure was short-lived. When Diane stepped into the shower one morning, she had no warning that the hot water heater was improperly vented. When the propane gas ignited to heat a steady flow of water flowing past red-hot burners, carbon monoxide built up in the small bathroom. Diane was washing her hair when the odorless fumes gradually overwhelmed her, causing her to lose consciousness and fall to the tile floor, her face a bright pink from the irreversible binding of carbon monoxide to hemoglobin in her blood. She had lain there for perhaps twenty minutes with water cascading over her limp body, when her husband returned to retrieve something he had forgotten. Had he not gone home, she would have died within the hour. But even though Diane survived and made an amazing recovery, her loved ones soon realized that parts of her had forever vanished, lost in patches of permanently atrophied brain tissue. When Diane woke from the coma, she was completely blind. Within a couple of days she could recognize colors and textures, but not shapes of objects or faces — not even her husband’s face or her own reflection in a handheld mirror. At the same time, she had no difficulty identifying people from their voices and could tell what objects were if they were placed in her hands. Dr. Milner was consulted because of his long-standing interest in visual problems following strokes and other brain injuries. He was told that Diane had come to Scotland, where her parents live, to see whether something could be done to help her. When Dr. Milner began his routine visual tests, it was obvious that Diane was blind in every traditional sense of the word. She could not read the largest letters on an eye chart and when he showed her two or three fingers, she couldn’t identify how many fingers he held up. At one point, Dr. Milner held up a pencil. “What’s this?” he asked. “I don’t know”, she replied. Diane was reluctant. “Try it”, he urged. Diane’s actions are amazing because we usually think of vision as a single process. When someone who is obviously blind can reach out and grab a letter, rotate the letter into the correct position and mail it through an opening she cannot “see”, the ability seems almost paranormal. To understand what Diane is experiencing, we need to abandon all our commonsense notions about what seeing really is. In the next few pages, you will discover that there is a great deal more to perception than meets the eye. Many people cling to the misconception that seeing simply involves scanning an internal mental picture of some kind. For example, not long ago I was at a cocktail party and a young fellow asked me what I did for a living. When I told him that I was interested in how people see things — and how the brain is involved in perception — he looked perplexed. “What’s there to study?” he asked. Though his knowledge of photoreceptors and and optics was impressive, his explanation — that there’s a screen somewhere inside the brain where images are displayed — embodies a serious logical fallacy. For if you were to display an image of a champagne glass on an internal neural screen, you’d need another little person inside the brain to see that image. And that won’t solve the problem either because you’d then need yet another, even tinier person inside his head to view that image, and so on and so forth, ad infinitum. You’d end up with an endless regress of eyes, images and little people without really solving the problem of perception. So the first step in understanding perception is to get rid of the idea of images in the brain and to begin thinking about symbolic descriptions of objects and events in the external world. A good example of a symbolic description is a written paragraph like the ones on this page. If you had to convey to a friend in China what your apartment looks like, you wouldn’t have to teletransport it to China. All you’d have to do would be to write a letter describing your apartment. Yet the actual squiggles of ink — the words and paragraphs in the letter — bear no physical resemblance to your bedroom. The letter is a symbolic description of your bedroom. What is meant by a symbolic description in the brain? Not squiggles of ink, of course, but the language of nerve impulses. The human brain contains multiple areas for processing images, each of which is composed of an intricate network of neurons that is specialized for extracting certain types of information from the image. Any object evokes a pattern of activity — unique for each object — among a subset of these areas. For example, when you look at a pencil, a book or a face, a different pattern of nerve activity is elicited in each case, “informing” higher brain centers about what you are looking at. The patterns of activity symbolize or represent visual objects in much the same way that the squiggles of ink on the paper symbolize or represent your bedroom. As scientists trying to understand visual processes, our goal is to decipher the code used by the brain to create these symbolic descriptions, much as a cryptographer tries to crack an alien script. Figure 4.1 Necker cube. Notice that this skeleton drawing of a cube can be seen in one of two different ways — either pointing upward and to the left or downward and to the right. The perception can change even when the image on your retina is constant. Thus perception involves much more than replicating an image in your brain. If vision were simply a faithful copy of reality in the same way that a photograph captures a scene, then your perception should always remain constant if the retinal image is held constant. But this is not the case. Your perceptions can change radically even when the image on your retina stays the same. A striking example was discovered in 1832 by the Swiss crystallographer L. A. Necker. One day he was looking through a microscope at a cuboid crystal and suddenly the thing flipped on him. Each time he looked, it seemed to change the way it was facing a physical impossibility. Necker was puzzled and wondered whether something inside his own head was flipping rather than the crystal itself. To test this strange notion, he made a simple line drawing of the crystal, and lo and behold, it, too, flipped (Figure 4.1). You can see it pointing up or down, depending on how your brain interprets the image, even though the image remains constant on your retina, not changing at all. 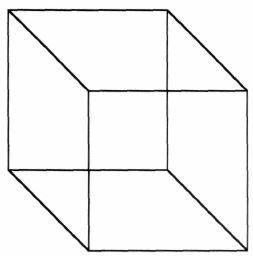 Thus every act of perception, even something as simple as viewing a drawing of a cube, involves an act of judgment by the brain. Take a look at the shaded images in Figure 4.2. These are just flat shaded disks, but you will notice that about half of them look like eggs bulging out at you, and the other half, randomly interspersed, look like hollow cavities. If you inspect them carefully, you’ll notice that the ones that are light on top appear to bulge out at you, whereas the ones that are dark on top look like cavities. If you turn the page upside down, you’ll see that they all reverse. The bulges become cavities and vice versa. The reason is that, in interpreting the shapes of shaded images, your visual system has a built-in assumption that the sun is shining from above, and that, in the real world, a convex object bulging toward you would be illuminated on the top whereas a cavity would receive light at the bottom. Given that we evolved on a planet with a single sun that usually shines from on high, this is a reasonable assumption.4 Sure, it’s sometimes on the horizon, but statistically speaking the sunlight usually comes from above and certainly never from below. Not long ago, I was pleasantly surprised to find that Charles Darwin had been aware of this principle. The tail feathers of the argus pheasant have striking gray disk-shaped markings that look very much like those you see in Figure 4.3; they are, however, shaded left to right instead of up and down. Darwin realized that the bird might be using this as a sexual “come hither” in its courtship ritual, the striking metallic-looking disks on the feathers being the avian equivalent of jewelry. But if so, why was the shading left to right instead of up and down? Darwin conjectured correctly that perhaps during courtship the feathers stick up, and indeed this is precisely what happens, illustrating a striking harmony in the birds’ visual system between its courtship ritual and the direction of sunlight. Figure 4.2 A mixture of eggs and cavities. The shaded disks are all identical except that half of them are light on top and the rest are dark on top. 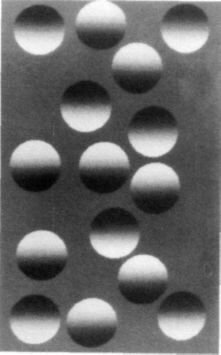 The ones that are light on top are always seen as eggs bulging out from the paper, whereas the ones that are dark on top are seen as cavities. This is because the visual areas in your brain have a built-in sense that the sun is shining from above. If that were true, then only bulges (eggs) would be light on top and concavities would be light below. If you turn the page upside down the eggs will transform themselves into cavities and cavities into eggs. Adapted from Ramachandran, 1988a. Even more compelling evidence of the existence of all these extraordinarily sophisticated processes in vision comes from neurology — from patients like Diane and others like her who have suffered highly selective visual deficits. If vision simply involves displaying an image on a neural screen, then in the case of neural damage, you would expect bits and pieces of the scene — or the whole scene — to be missing, depending on the extent of damage. But the defects are usually far more subtle than that. To understand what is really going on in the brains of these patients and why they suffer such peculiar problems, we need to look more closely at the anatomical pathways concerned with vision. 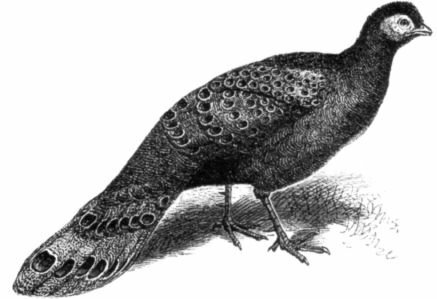 Figure 4.3 The tail feathers of the argus pheasant have prominent disklike markings ordinarily shaded left to right instead of top to bottom. Charles Darwin pointed out that when the bird goes through its courtship ritual, the tail points up. The disks then are light on topmaking them bulge out prominently like the eggs in Figure 4.2. This may be the closest thing to the avian equivalent of jewelry. From The Descent of Man by Charles Darwin (1871), John Murray, London. Figure 4.4 Bottom of the human brain viewed from below. Notice the curious arrangement of fibers going from the retina to the visual cortex. A visual image in the left visual field (dark gray) falls on the right side of the right eye’s retina as well as the right side of the left eye’s retina. The outer (temporal) fibers from the right eye (dark gray) go then to the same right (visual) cortex without crossing at the optic chiasm. The inner (nasal) fibers of the left eye (dark gray) cross at the chiasm and go to the right visual cortex as well. So the right visual cortex “sees” the left side of the world. Because there is a systematic map of the retina in the visual cortex, a “hole” in the visual cortex will cause a corresponding blind spot (or scotoma) in the visual field. If the right visual cortex is completely removed, the patient will be completely blind in the left side of the world. Redrawn from S. Zeki, A Vision of the Brain, 1993. Reproduced with permission from Blackwell (Oxford). This raises an interesting question. Why do we need thirty areas?6 We really don’t know the answer, but they appear to be highly specialized for extracting different attributes from the visual scene — color, depth, motion and the like. When one or more areas are selectively damaged, you are confronted with paradoxical mental states of the kind seen in a number of neurological patients. One of the most famous examples in neurology is the case of a Swiss woman (whom I shall call Ingrid) who suffered from “motion blindness”. Ingrid had bilateral damage to an area of her brain called the middle temporal (MT) area. In most respects, her eyesight was normal; she could name shapes of objects, recognize people and read books with no trouble. But if she looked at a person running or a car moving on the highway, she saw a succession of static, strobelike snapshots instead of the smooth impression of continuous motion. She was terrified to cross the street because she couldn’t estimate the velocity of oncoming cars, though she could identify the make, color and even the license plate of any vehicle. She said that talking to someone in person felt like talking on the phone because she couldn’t see the changing facial expressions associated with normal conversation. Even pouring a cup of coffee was an ordeal because the liquid would inevitably overflow and spill onto the floor. She never knew when to slow down, changing the angle of the coffeepot, because she couldn’t estimate how fast the liquid was rising in the cup. All of these abilities ordinarily seem so effortless to you and me that we take them for granted. It’s only when something goes wrong, as when this motion area is damaged, that we begin to realize how sophisticated vision really is. Another example involves color vision. When patients suffer bilateral damage to an area called V4, they become completely color-blind (this is different from the more common from of congenital color blindness that arises because color-sensitive pigments in the eye are deficient). In his book An Anthropologist on Mars, Oliver Sacks describes an artist who went home one evening after suffering a stroke so small he didn’t notice it at the time. But when he walked into his house, all his color paintings suddenly looked as if they had been done in black and white. In fact, the whole world was black and white and soon he realized that the paintings had not changed, but rather something had happened to him. When he looked at his wife, her face was a muddy gray color — he claimed she looked like a rat. So that covers two of the thirty areas — MT and V4 — but what about all the rest? Undoubtedly they’re doing something equally important, but we have no clear ideas yet of what their functions might be. Yet despite the bewildering complexity of all these areas, the visual system appears to have a relatively simple overall organization. Messages from the eyeballs go through the optic nerve and immediately bifurcate along two pathways — one phylogenetically old and a second, newer pathway that is most highly developed in primates, including humans. Moreover, there appears to be a clear division of labor between these two systems. The “older” pathway goes from the eye straight down to a structure called the superior colliculus in the brain stem, and from there it eventually gets to higher cortical areas especially in the parietal lobes. 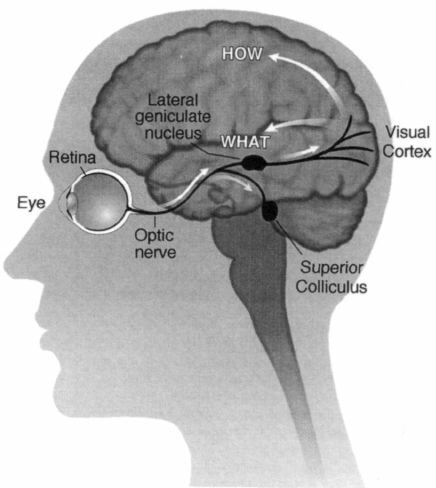 The “newer” pathway, on the other hand, travels from the eyes to a cluster of cells called the lateral geniculate nucleus, which is a relay station en route to the primary visual cortex (Figure 4.5). From there, visual information is transmitted to the thirty or so other visual areas for further processing. Why do we have an old pathway and a new pathway? One possibility is that the older pathway has been preserved as a sort of early warning system and is concerned with what is sometimes called “orienting behavior”. For example, if a large looming object comes at me from the left, this older pathway tells me where the object is, enabling me to swivel my eyeballs and turn my head and body to look at it. This is a primitive reflex that brings potentially important events into my fovea, the high-acuity central region of my eyes. At this stage I begin to deploy the phylogenetically newer system to determine what the object is, for only then can I decide how to respond to it. Should I grab it, dodge it, flee from it, eat it, fight it or make love to it? Damage to this second pathway — particularly in the primary visual cortex — leads to blindness in the conventional sense. It is most commonly brought on by a stroke — a leakage or blood clot in one of the main blood vessels supplying the brain. If the vessel happens to be a cerebral artery in the back of the brain, damage can occur in either the left or the right side of the primary visual cortex. When the right primary cortex is damaged, the person is blind in the left visual field, and if the left primary cortex is damaged, the right visual field is obliterated. This kind of blindness, called hemianopia, has been known about for a long time. Figure 4.5 The anatomical organization of the visual pathways. Schematic diagram of the left hemisphere viewed from the left side. 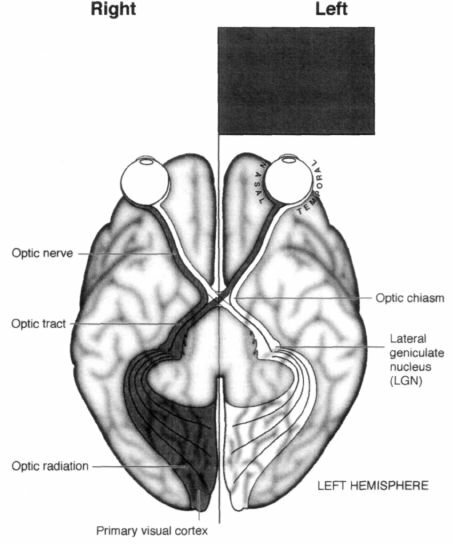 The fibers from the eyeball diverge in two parallel “streams”: a new pathway that goes to the lateral geniculate nucleus (shown here on the surface for clarity, though it is actually inside the thalamus, not the temporal lobe) and an old pathway that goes to the superior colliculus in the brain stem. The “new” pathway then goes to the visual cortex and diverges again (after a couple of relays) into two pathways (white arrows)a “how” pathway in the parietal lobes that is concerned with grasping, navigation and other spatial functions, and the second, “what” pathway in the temporal lobes concerned with recognizing objects. These two pathways were discovered by Leslie Ungerleider and Mortimer Mischkin of the National Institutes of Health. The two pathways are shown by white arrows. But it, too, holds surprises. Dr. Larry Weiskrantz, a scientist working at Oxford University in England, did a very simple experiment that stunned experts on vision.7 His patient (known as D.B., whom I will call Drew) had an abnormal clump of blood vessels surgically removed from his brain along with some normal brain tissue in the same vicinity. Since the malformed clump was located in the right primary visual cortex, the procedure rendered Drew completely blind to the left half of the world. It did not matter whether he used his left eye or right eye — if he looked straight ahead, he could not see anything on the left side of the world. In other words, although he could see out of both eyes, neither eye could see its own left visual field. After the surgery Drew’s ophthalmologist, Dr. Mike Sanders, asked him to gaze straight ahead at a small fixation spot mounted in the center of a device that looks like an enormous translucent Ping-Pong ball. Drew’s entire visual field was filled with a homogeneous background. Next, Dr. Sanders flashed spots of light onto different parts of the curved screen mounted on the inside of a ball and asked Drew whether he could see them. Each time a spot fell into his good visual field, he’d say, “Yes, yes, yes”, but when the spot fell into his blind region he would say nothing. He didn’t see it. So far so good. Dr. Sanders and Dr. Weiskrantz then noticed something very odd. Drew was obviously blind in the left visual field, but if the experimenter put his hand in that region Drew reached out for it accurately! “No”, Drew replied, with an air of incredulity. Dr. Weiskrantz and his colleagues gave this phenomenon an oxymoronic name — “Hindsight” — and went on to document it in other patients. The discovery is so surprising, however, that many people still don’t accept that the phenomenon is possible. Dr. Weiskrantz questioned Drew repeatedly about his “vision” in his blind left field, and most of the time Drew said that he saw nothing at all. If pressed, he might occasionally say that he had a “feeling” that a stimulus was approaching or receding or was “smooth” or “jagged”. But Drew always stressed that he saw nothing in the sense of “seeing”; that he was typically guessing and that he was at a loss for words to describe any conscious perception. The researchers were convinced that Drew was a reliable and honest reporter, and when test objects fell near the cusp of his good visual field, he always said so promptly. Without invoking extrasensory perception, how do you account for blindsight — a person’s pointing to or correctly guessing the presence of an object that he cannot consciously perceive? Dr. Weiskrantz suggested that the paradox is resolved when you consider the division of labor between the two visual pathways that we considered earlier. In particular, even though Drew had lost his primary visual cortex — rendering him blind — his phylogenetically primitive “orienting” pathway was still intact, and perhaps it mediates blindsight. In other words, the spot of light in the blind region — even though it fails to activate the newer pathway, which is damaged — gets transmitted through the superior colliculus to higher brain centers such as the parietal lobes, guiding Drew’s arm toward the “invisible” spot. This daring interpretation carries with it an extraordinary implication — that only the new pathway is capable of conscious awareness (“I see this”), whereas the old pathway can use visual input for all kinds of behavior, even though the person is completely unaware of what is going on. Does it follow, then, that consciousness is a special property of the evolutionarily more recent visual cortex pathway? If so, why does this pathway have privileged access to the mind? These are questions we’ll consider in the last chapter. What we have considered so far is the simple version of the perception story, but in fact the picture is a bit more complicated. It turns out that information in the “new” pathway — the one containing the primary visual cortex that purportedly leads to conscious experience (and is completely damaged in Drew) — once again diverges into two distinct streams. One is the “where” pathway, which terminates in the parietal lobe (on the sides of your brain above the ears); the other, sometimes called the “what” pathway, goes to the temporal lobe (underlying the temples). And it looks as though each of these two systems is also specialized for a distinct subset of visual functions. Actually the term “where” pathway is a little misleading because this system specializes in not just “where” — in assigning spatial location to objects — but in all aspects of spatial vision: the ability of organisms to walk around the world, negotiate uneven terrain and avoid bumping into objects or falling into black pits. It probably enables an animal to determine the direction of a moving target, to judge the distance of approaching or receding objects and to dodge a missile. If you are a primate, it helps you reach out and grab an object with your fingers and thumb. Indeed, the Canadian psychologist Mel Goodale has suggested that this system should really be called the “vision for action pathway” or the “how pathway” since it seems to be mainly concerned with visually guided movements. (From here on I will call it the “how” pathway.) Now you may scratch your head and say, My God, what’s left? What remains is your ability to identify the object; hence the second pathway is called the “what” pathway. The fact that the majority of your thirty visual areas are in fact located in this system gives you some idea of its importance. Is this thing you are looking at a fox, a pear or a rose? Is this face an enemy, friend or mate? Is it Drew or Diane? What are the semantic and emotional attributes of this thing? Do I care about it? Am I afraid of it? Three researchers, Ed Rolls, Charlie Gross and David Perrett, have found that if you put an electrode into a monkey’s brain to monitor the activity of cells in this system, there is a particular region where you find so-called face cells — each neuron fires only in response to the photograph of a particular face. Thus one cell may respond to the dominant male in the monkey troop, another to the monkey’s mate, another to the surrogate alpha male — that is, to the human experimenter. This does not mean that a single cell is somehow responsible for the complete process of recognizing faces; the recognition probably relies on a network involving thousands of synapses. Nevertheless, face cells exist as a critical part of the network of cells involved in the recognition of faces and other objects. Once these cells are activated, their message is somehow relayed to higher areas in the temporal lobes concerned with “semantics” — all your memories and knowledge of that person. Where did we meet before? What is his name? When is the last time I saw this person? What was he doing? Added to this, finally, are all the emotions that the person’s face evokes. To illustrate further what these two streams — the what and how pathways — are doing in the brain, I’d like you to consider a thought experiment. In real life, people have strokes, head injuries or other brain accidents and may lose various chunks of the how and what streams. But nature is messy and rarely are losses confined exclusively to one stream and not the other. So let’s assume that one day you wake up and your what pathway has been selectively obliterated (perhaps a malicious doctor entered in the night, knocked you out and removed both your temporal lobes). I’d venture to predict that when you woke up the entire world would look like a gallery of abstract sculpture, a Martian art gallery perhaps. No object you looked at would be recognizable or evoke emotions or associations with anything else. You’d “see” these objects, their boundaries and shapes, and you could reach out and grab them, trace them with your finger and catch one if I threw it at you. In other words, your how pathway would be functional. But you’d have no inkling as to what these objects were. It’s a moot point as to whether you’d be “conscious” of any of them, for one could argue that the term consciousness doesn’t mean anything unless you recognize the emotional significance and semantic associations of what you are looking at. Two scientists, Heinrich Kl?ver and Paul Bucy at the University of Chicago, have actually carried out an experiment like this on monkeys by surgically removing their temporal lobes containing the what pathway. The animals can walk around and avoid bumping into cage walls — because their how pathway is intact — but if they are presented with a lit cigarette or razor blade, they will likely stuff it into their mouths and start chewing. Male monkeys will mount any other animal including chickens, cats or even human experimenters. They are not hypersexual, just indiscriminate. They have great difficulty in knowing what prey is, what a mate is, what food is and in general what the significance of any object might be. Are there any human patients who have similar deficits? On rare occasions a person will sustain widespread damage to both temporal lobes and develop a cluster of symptoms similar to what we now call the Kl?ver-Bucy syndrome. Like the monkeys, they may put anything and everything into their mouths (much as babies do) and display indiscriminate sexual behavior, such as making lewd overtures to physicians or to patients in adjacent wheelchairs. Such extremes of behavior have been known for a long time and lend credibility to the idea that there is a clear division of labor between these two systems — and that brings us back to Diane. Though her deficit is not quite so extreme, Diane also had dissociation between her what and how vision systems. She couldn’t tell the difference between a horizontal and a vertical pencil or a slit because her what pathway had been selectively obliterated. But since her how pathway was still intact (as indeed was her evolutionarily older “orienting behavior” pathway), she was able to reach out and grab a pencil accurately or rotate a letter by the correct angle to post it into a slot that she could not see. To make this distinction even more clear, Dr. Milner performed another ingenious experiment. After all, posting letters is a relatively easy, habitual act and he wanted to see how sophisticated the zombie’s manipulative abilities really were. Placing two blocks of wood in front of Diane, a large and a small one, Dr. Milner asked her which was bigger. He found, not surprisingly, that she performed at chance level. But when he asked her to reach out and grab the object, once again her arm went unerringly toward it with thumb and index finger moving apart by the exact distance appropriate for that object. All this was verified by videotaping the approaching arm and conducting a frame-by-frame analysis of the tape. Again, it was as though there were an unconscious “zombie” inside Diane carrying out complicated computations that allowed her to move her hand and fingers correctly, whether she was posting a letter or simply grabbing objects of different sizes. The “zombie” corresponded to the how pathway, which was still largely intact, and the “person” corresponded to the what pathway, which was badly damaged. Diane can interact with the world spatially, but she is not consciously aware of the shapes, locations and sizes of most objects around her. She now lives in a country home, where she keeps a large herb garden, entertains friends and carries on an active, though protected, life. But there’s another twist to the tale, for even Diane’s what pathway was not completely damaged. Although she couldn’t recognize the shapes of objects — a line drawing of a banana would not look different from a drawing of a pumpkin — as I noted at the beginning of this chapter, she had no problem distinguishing colors or visual textures. She was good at “stuff” rather than “things” and knew a banana from a yellow zucchini by their visual textures. The reason for this might be that even within the areas constituting the what pathway, there are finer subdivisions concerned with color, texture and form, and the “color” and “texture” cells might be more resistant to carbon monoxide poisoning than the “form” cells. The evidence for the existence of such cells in the primate brain is still fiercely debated by physiologists, but the highly selective deficits and preserved abilities of Diane give us additional clues that exquisitely specialized regions of this sort do indeed exist in the human brain. If you’re looking for evidence of modularity in the brain (and ammunition against the holist view), the visual areas are the best place to look. Now let’s go back to the thought experiment I mentioned earlier and turn it around. What might happen if the evil doctor removed your how pathway (the one that guides your actions) and left your what system intact? You’d expect to see a person who couldn’t get her bearings, who would have great difficulty looking toward objects of interest, reaching out and grabbing things or pointing to interesting targets in her visual field. Something like this does happen in a curious disorder called Balint’s syndrome, in which there is bilateral damage to the parietal lobes. In a kind of tunnel vision, the patient’s eyes stay focused on any small object that happens to be in her foveal vision (the high-acuity region of the eye), but she completely ignores all other objects in the vicinity. If you ask her to point to a small target in her visual field, she’ll very likely miss the mark by a wide margin — sometimes by a foot or more. But once she captures the target with her two foveas, she can recognize it effortlessly because her intact what pathway is engaged in full gear. The discovery of multiple visual areas and the division of labor between the two pathways is a landmark achievement in neuroscience, but it barely begins to scratch the surface of the problem of understanding vision. If I toss a red ball at you, several far-flung visual areas in your brain are activated simultaneously, but what you see is a single unified picture of the ball. Does this unification come about because there is some later place in the brain where all this information is put together — what the philosopher Dan Dennett pejoratively calls a “Cartesian theatre”?8 Or are there connections between these areas so that their simultaneous activation leads directly to a sort of synchronized firing pattern that in turn creates perceptual unity? This question, the so-called binding problem, is one of the many unsolved riddles in neuroscience. Indeed, the problem is so mysterious that there are philosophers who argue it is not even a legitimate scientific question. The problem arises, they argue, from peculiarities in our use of language or from logically flawed assumptions about the visual process. Despite this reservation, the discovery of the how and what pathways and of multiple visual areas has generated a great deal of excitement, especially among young researchers entering the field.9 It’s now possible not only to record the activity of individual cells but also to watch many of these areas light up in the living human brain as a person views a scene — whether it’s something simple like a white square on a black background or something more complex like a smiling face. Furthermore, the existence of regions that are highly specialized for a specific task gives us an experimental lever for approaching the question posed at the beginning of this chapter: How does the activity of neurons give rise to perceptual experience? For instance, we now know that cones in the retina first send their outputs to clusters of color-sensitive cells in the primary visual cortex fancifully called blobs and thin stripes (in the adjacent area 18) and from there to V4 (recall the man who mistook his wife for a hat) and that the processing of color becomes increasingly sophisticated as you go along this sequence. Taking advantage of the sequence and of all this detailed anatomical knowledge, we can ask, How does this specific chain of events result in our experience of color? Or, recalling Ingrid, who was motion blind, we can ask, How does the circuitry in the middle temporal area enable us to see motion? As the British immunologist Peter Medawar has noted, science is the “art of the soluble”, and one could argue that the discovery of multiple specialized areas in vision makes the problem of vision soluble, at least in the foreseeable future. To his famous dictum, I would add that in science one is often forced to choose between providing precise answers to piffling questions (how many cones are there in a human eye) or vague answers to big questions (what is the self), but every now and then you come up with a precise answer to a big question (such as the link between deoxyribonucleic acid [DNA] and heredity) and you hit the jackpot. It appears that vision is one of the areas in neuroscience where sooner or later we will have precise answers to big questions, but only time will tell. In the meantime, we’ve learned a great deal about the structure and function of the visual pathways from patients like Diane, Drew and Ingrid. For example, even though Diane’s symptoms initially seemed outlandish, we can now begin to explain them in terms of what we learned about the two visual pathways the what pathway and the how pathway. It’s important to keep reminding ourselves, though, that the zombie exists not only in Diane but in all of us. Indeed, the purpose of our whole enterprise is not simply to explain Diane’s deficits but to understand how your brain and my brain work. Since these two pathways normally work in unison, in a smooth coordinated fashion, it’s hard to discern their separate contributions. But it’s possible to devise experiments to show that they do exist and work to some extent independently even in you and me. To illustrate this, I’ll describe one last experiment. Figure 4.6 The size-contrast illusion. The two central medium-sized disks are physically identical in size. Yet the one surrounded by the large disks looks smaller than the one surrounded by the little ones. When a normal person reaches out to grab the central disk, his/her fingers move exactly the same distance apart for either of them even though they look different in size. The zombie or the “how” pathway in the parietal lobes is apparently not fooled by the illusion. 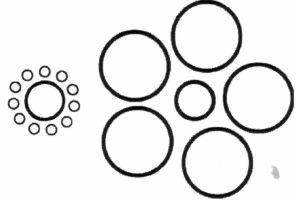 The experiment was carried out by Dr. Salvatore Aglioti,10 who took advantage of a well-known visual illusion (Figure 4.6) involving two circular disks side by side, identical in size. One of them is surrounded by six tiny disks and the other by six giant disks. To most eyes, the two central disks do not look the same size. The one surrounded by big disks looks about 30 percent smaller than the one with small disks an illusion called size contrast. It is one of many illusions used by Gestalt psychologists to show that perception is always relative never absolute always dependent on the surrounding context. Instead of using a line drawing to get this effect, Dr. Aglioti set two medium-sized dominoes on a table. One was surrounded with larger dominoes and the second with smaller dominoes just like the disks. As with the disks, when a student looked at the two central dominoes, one looked obviously smaller than the other. But the astonishing thing is that when he was asked to reach out and pick up one of the two central dominoes, his fingers moved the right distance apart as his hand approached the domino. A frame-by-frame analysis of his hand revealed that the fingers moved apart exactly the same amount for each of the two central dominoes, even though to his eyes (and to yours) one looks 30 percent bigger. Obviously, his hands knew something that his eyes did not, and this implies that the illusion is only “seen” by the object stream in his brain. The how stream the zombie is not fooled for a second, and so “it” (or he) was able to reach out and correctly grasp the domino. This little experiment may have interesting implications for day-to-day activities and athletics. Marksmen say that if you focus too much on a rifle target, you will not hit the bull’s-eye; you need to “let go” before you shoot. Most sports rely heavily on spatial orientation. A quarterback throws the ball toward an empty spot on the field, calculating where the receiver will be if he is not tackled. An outfielder starts running the moment he hears the crack of a baseball coming into contact with a bat, as his how pathway in the parietal lobe calculates the expected destination of the ball given this auditory input. Basketball players can even close their eyes and toss a ball into the basket if they stand on the same spot on the court each time. Indeed, in sports as in many aspects of life, it may pay to “release your zombie” and let it do its thing. There’s no direct evidence that all of this mainly involves your zombie — the how pathway — but the idea can be tested with brain imaging techniques. My eight-year-old son, Mani, once asked me whether maybe the zombie is smarter than we think, a fact that is celebrated in both ancient martial arts and modern movies like Star Wars. When young Luke Skywalker is struggling with his conscious awareness, Yoda advises, “Use the force. Feel it. Yes”, and “No. Try not! Do or do not. There is no try”. Was he referring to a zombie? I answered, “No”, but later began to have second thoughts. For in truth, we know so little about the brain that even a child’s questions should be seriously entertained. The most obvious fact about existence is your sense of being a single, unified self “in charge” of your destiny; so obvious, in fact, that you rarely pause to think about it. And yet Dr. Aglioti’s experiment and observations on patients like Diane suggest that there is in fact another being inside you that goes about his or her business without your knowledge or awareness. And, as it turns out, there is not just one such zombie but a multitude of them inhabiting your brain. If so, your concept of a single “I” or “self” inhabiting your brain may be simply an illusion11 — albeit one that allows you to organize your life more efficiently, gives you a sense of purpose and helps you interact with others. This idea will be a recurring theme in the rest of this book.